It’s Meatless Monday again! I’ve had this recipe in my file for so long and have never made it. I almost didn’t make them again because I had something planned on Saturday night which I was excited to make and didn’t because we impromtuly went to Disneyland that day after Eric got off of work, except I remembered I had a meeting and Eric was going to have to feed our daughter dinner, so I thought this was a good one to prep ahead of time and he could just pop it in the oven! I couldn’t believe how easy these were to make! I think I’ve made lasagna maybe three times in my whole life because it just seems so intimidating (where on earth I came up with that, I have no idea). I just couldn’t believe how simply these came together. Dump it all in a bowl, stir, lay it all on a lasagna noodle, roll & put in the pan. Viola! I didn’t get to eat this hot ( a) because I didn’t want to heat up the oven to warm it up and b) the roof of my mouth is blistered from the pizza! ), and really thought it lacked big flavor (and I am a fan of big flavor! ), so I sprinkled it with salt. I wonder how it would be hot? It was just “ok” cold the next day. My husband said it was “good” and decided to inform me he doesn’t like spinach because it tasted like beets… (I think a good term for that is “earthy”) so it wasn’t his favorite. However, our daughter apparently loved it! I made her her own spinachless version since she refuses to eat anything leafy and definitely anything wilted and leafy. I froze the leftovers for a day I’m dreading cooking dinner! I don’t think this is something I’ll make again. Too many recipes, so little time. Preheat oven to 350°. Make sure you drain the spinach well. Combine spinach, ricotta, Parmesan cheese, egg, garlic, Italian seasonings, chicken, and salt and pepper in a medium bowl. Pour about 1 cup sauce on the bottom of a 9 x 13 baking dish. Place a piece of wax paper on the counter and lay out lasagna noodles. Make sure noodles are dry by patting them with a paper towel. Take 1/3 cup of ricotta mixture and spread evenly over a noodle. Roll carefully and place seam side down onto the baking dish. Repeat with remaining noodles. 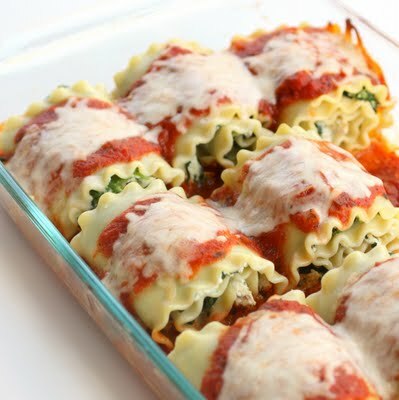 Ladle sauce over the noodles in the baking dish and top each one with 1 Tablespoon of mozzarella cheese. Cover baking dish tightly with aluminum foil and bake for 40 minutes, or until cheese melts. Makes 9 rolls.